When you think of the origins of great college fall sport rivalries, it is usually football that comes to mind: Princeton vs. Rutgers, Harvard vs. Yale, Notre Dame vs. Michigan. In the game of college match racing, an ancient tradition was rekindled in modern spirit with the second annual Hamilton Burr Regatta, held in New York, NY the Saturday after Labor Day. This event, a match race challenge between Columbia University in New York City and Princeton University in Princeton, NJ, drew participants and spectators to benefit the after-school sailing education and leadership programs of Hudson River Community Sailing (HRCS). A non-profit organization located at Pier 66 on the Hudson, HRCS provides sailing and marine education to underserved New York City youth. Actually, the sailing teams of Princeton and Columbia have competed against each other in team racing since the 1920s. That rivalry continues in the spirit of the two historic duelists, Alexander Hamilton and Aaron Burr, who fought on the New Jersey bluffs above the Hudson River in 1804. History buffs may recall that Hamilton attended Columbia (then called Kings College) and Burr was a Princeton grad (known as the College of New Jersey where his father served as President). 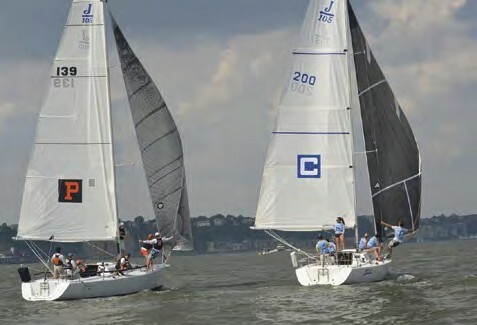 The Hamilton Burr Regatta (HBR), the first match racing event for college teams in the New York City area, was first sailed in 2013 by graduates and undergraduates of Columbia University and Princeton University wishing to perpetuate the legacy of competitive spirit and civic responsibility of Alexander Hamilton and Aaron Burr as public servants. Hosted by HRCS, the HBR is dedicated to promoting college match racing while inspiring “citizen sailors” to give back to their local sailing community through sailing education. An official Deed of Challenge signed by the Princeton “Burrs” and the Columbia “Hamiltons” commits the two parties to a duel on the Hudson River. Each school chooses the “weapons” in alternating years, with Columbia selecting in odd-numbered years and Princeton in even years. This year, the Burrs picked J/105s, which were borrowed from the North Cove Marina/Manhattan Yacht Club fleet. Jason Mraz, a 1989 Princeton grad from Brooklyn, lent one boat for the duel and another owner, a Georgetown grad, contributed the second. 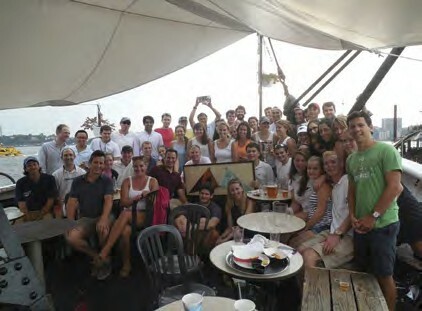 Two groups of undergrads and alumni assembled pick-up crews to contest a best-of-five match racing series. Over 50 sailors representing the two schools gathered at HRCS, just north of Chelsea Piers. Andrew Grasso, a Princeton senior and team captain, led the Princeton Burrs. Will Hubbard, a Columbia grad from the late 2000s, organized the Hamiltons. The idea was to have two squads from each school, an “A” and “B” team, to maximize involvement of both grads and undergrads. It was easy to identify the teams with their signature colored pinnies over the required lifejackets. Further identification was provided by large “P” and “C” emblems on their respective mainsails. HRCS ran the race committee, and volunteers shuttled participants from the pier out to the boats. With no weight limits, crews on each boat numbered double digits. As match racing rules are not as well known by college sailors and pre-race experience with the big wheels and asymmetrical chutes of the 105s was limited, a decision was made to race without spinnakers. This was wise, as winds rose all day in anticipation of a strong cold front rolling in from the west. A strong south running ebb tide and southerly breeze put a premium on winning the start, as upwind legs were over quickly and the boats then slowed to a crawl for the downwind finishing leg. Columbia began the first race from the favored starboard position after winning the event’s traditional pre-race shoreside “duel” (tossing bean bags into a bucket at 20 paces; most bags in wins). Executing the starting sequence well, the Lions got off the line and held their lead upwind and down. Princeton had starboard entry for the second start, but Columbia’s aggressive tactics drew a Burr penalty that, post-spin, left them behind at the start. Princeton tried a leeward pass on the downwind leg, but Columbia had a two-boatlength lead at the finish. The third start was even, initiating a fierce tacking duel and although the Burrs had a brief downwind lead, the Hamiltons won Race 3 and the title with a photo finish. The boats traded out most of their crew for undergraduate sailors in the “B” group. This time, Princeton turned it around for a solid win. With worsening weather conditions, a bolt of lightning off Ellis Island convinced the RC to call it a day with the contest scored Columbia 3, Princeton 1. Fortunately the storm passed by to do damage elsewhere in the Five Boroughs, and back on shore the teams celebrated with a reception and awards on the Frying Pan, a former North Carolina lightship moored at the adjacent pier. The Hamiltons were champions on the water, but it was the Burrs who were awarded the Citizen Sailor Trophy for the philanthrophic zeal of their supporters and friends. The Third Anniversary HBR duel will be held on Saturday, September 5, 2015. A formal challenge will be issued by the Hamiltons at the Hamilton Burr Spring Party in April. 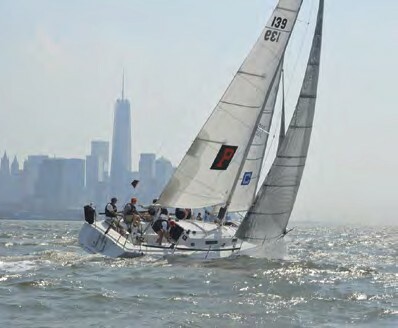 The event’s mission is threefold: to support the respective collegiate sailing teams at Princeton and Columbia; to increase awareness and access to competitive sailing in New York waters; and to give back to the New York City sailing community by raising money and awareness for charitable programs. All graduates, friends, family and supporters are invited to learn more and contribute to the citizen-sailor mission at hamiltonburr.com. Photos can be viewed at hamiltonburr.com/2014-gallery. HRCS develops leadership and academic success in underserved New York City youth through sailing education and provides maritime education and recreation to the community at large. HRCS runs Sail Academy, a for-credit after school program for public high school students in Manhattan that teaches math, science, physical education and leadership through sailing and boat building. Learn more at hudsonsailing.org or by contacting Alex Baum at abaum@hudsonsailing.org. Tom Darling is a 1975 graduate of Princeton University, and was captain of the school’s Varsity Sailing Team in 1974 and ’75. He races IODs in the Western Long Island Sound and Nantucket fleets and crews on a classic wooden Alerion sloop in Nantucket Harbor.